Sanity and compassion prevail in New York... for now. Wow. I am so accustomed to myth-based wildlife management policy swaying legislators (who are too lazy to do their homework), both Canadian and American, that it's hard to believe what has happened, at least to date, in New York state (just across the lake from where I live, in Ontario). Senator Tony Avella recently announced the unanimous passage of his state legislation (S. 6589) by the state senate. This sets up a two year moratorium on plans by the ironically named Department of Environmental Conservation (DEC) to kill all mute swans in New York state: every last individual. While this has, inevitably, been called a victory for "animal rights and environmental protection groups," it is much, much more than that. It is a victory for reason, logic, science and yes -- compassion. Mute swans are those white swans with the curved necks, orange beaks, with black knobs at the forehead, who often "fluff" their wings into a graceful, sail-like configuration as part of their wonderful breeding display. They are seen in estate ponds, zoos, parks, and, increasingly, along urban waterfronts. Mute swans are native to Eurasia and distinct from North America's two native swan species, the tundra swan and the trumpeter swans. 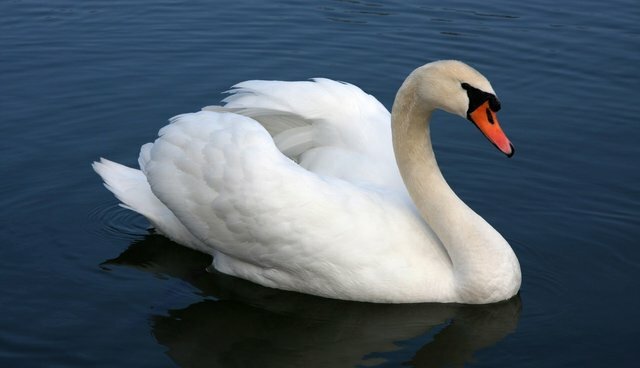 Both native swans have tapered black (not orange) beaks, no knobs, and are less likely to carry their necks curved, and lack that characteristic "sail" display of the mute swan. Additionally, they are highly migratory, while mute swans are generally less so, if at all. Seeing them -- the epitome of grace and beauty -- it may be difficult to understand why anyone would kill one, let alone every single one in an entire state. I think there are two answers: one official, and one not. Officially, they are demonized for eating submerged vegetation needed by native waterfowl; for chasing native waterfowl from nesting areas, thereby usurping wetlands; and for pulling up emergent vegetation. The concern is simplified by calling the mute swan an alien, non-native, foreign bird who is displacing our native waterfowl -- waterfowl that, I might add, are "game" birds shot by hunters, bringing in revenue that pays salaries of wildlife managers who want to kill off the mutes. Mutes are not very sporting prey... You can walk right up to most of them, and they tend to take food from the hands of kids, making it harder to shoot them. But, it's not nearly that simple. North America's trumpeter swan was nearly exterminated by excessive hunting, particularly for the "fur" trade. (Back then, it included an equal trade in the feathered skins of birds.) We know that it nested in the western mountains and northern forests, and that many wintered on the mid to south U.S. Atlantic coast. There is no proof of them nesting much, if at all, east of the Great Plains and Mississippi drainage, but facts don't matter to groups like DEC, and there is a massive bi-national effort to "restore" them as a breeding species in the east. No one admits it in so many words, but I suspect the hope is that, being highly migratory, they will eventually become another waterfowl species to entice the dwindling numbers of waterfowl hunters to load up their shotguns, and buy those licenses so important in providing money to pay wages of wildlife managers. But, people intuitively love mute swans, so they must be demonized. Being "alien" helps, though there is a huge hypocrisy involved. The same agencies that decry the bird's foreign origins fail to mention that, by itself, that is hardly a problem when it comes to so many other species (including the brown trout, ring-necked pheasant, coho salmon and other "game" animals that they, themselves, cheerfully add to the environment). So, being "alien" is only selectively a concern. In fact, most of the plants and a huge percentage of the animals we see in the wetlands are not native. More to the point, either the exact same species, or ones quite like them, co-exist with mute swans in Eurasian wetlands, begging the question (seldom asked and never answered): What makes the same, or very similar, species so vulnerable over here? And, why more vulnerable to mute swans than to trumpeter swans, whose "re"introduction is not challenged? One of the most abundant plants in wetlands is the common reed, Phragmites, which is choking out wetlands. It is not native, but it is far too established to eliminate, and if mutes pull them out, isn't that good? In fact, we have "Europeanized" so much of North America that it is far more suitable for mute swans than for trumpeters. Many Eurasian bird species, including other swans, have reached North America on their own, some establishing themselves as breeding species -- and, in the fullness of time, the mute swan might, too. And, don't forget that they are also common here in Ontario, across the lake, and we are not killing them... So, to keep New York mute swans free would require endlessly killing each one seen. Really, isn't that a tad absurd? But, most tellingly, there is nothing "bad" that a mute swan does that a trumpeter swan does not also do. (Plus, the latter is a lot noisier!) So, good for Senator Avella and his colleagues for seeing through the nonsense and making the logical, compassionate choice. Sadly, the people in another neighboring region, the state of Michigan, show signs of being bamboozled by similar rhetoric from their own, but with a twist that would be humorous, were it not tragic for the swans... The mute swans chase Canada geese. Yes... From their nesting sites... But, do they not see the irony of also complaining about "too many" Canada geese? Also, how to explain the success that Canada geese have had in "invading" Europe, where, like mute swans in North America, the geese have escaped captivity and become established as an "alien" species? It would all be so funny, were it not so darn sad.